As the architect/client, my wife and I had a vision: we either wanted to renovate an existing home for maximum efficiency or find a pre-developed site to begin a self-sufficient homestead. This 44 acre site was chosen for its solar access, agricultural potential and the existing 180' x 80' riding arena, with a residence within. Upon purchasing the property neighbors came forward who were interested in starting their own horse boarding business, and they moved the prefab metal structure piece by piece around the corner, to its new location, saving everything down to the roofing screws. Our master site plan kept the new house and the new parking area as well as any future outbuildings within the existing footprint of the old arena. This allowed minimal impact to the remaining 43 acres and for full solar access. The topography of the site included a hillside to the east and a high knoll to the west creating a wind tunnel effect for the prevailing southern winds. The property also had a few old trails which were linked to conservation land, which we restored for the community to use. The construction of the house commenced in September of 2006 and was completed in August of 2007. Work on the land is ongoing. To date we have constructed a chicken coop with 20 chickens, planted 6 additional apple trees and made a 30 x 70 vegetable garden. The fields are being used for hay. There were several goals in mind when we set out to design this single family residence in Charlotte, Vermont. It was our intention to create a house that maintained all the amenities of a conventional home with as little environmental impact as possible, to eliminate all fossil fuel burning on site, to maintain a high level of design and detail and to use the most conventional means and methods possible so that it would be affordable and replicable. The challenge was to do all of this in a cold northern climate. We knew that the only way to achieve net zero energy use was to create a house which had an ultra low energy budget utilizing all the natural renewable energy sources the site had to offer. The solution was to create an all electric house using the sun's energy passively, using the earth for mechanical heating and domestic hot water and the wind via a single net metered 10KW Wind Turbine. The house is a documented and verified net energy producer putting more energy back into the grid than it uses for all of its needs including cooking. In addition to being 5+ star ENERGY STAR rated (0 HERS Score) and Vermont Builds Greener certified, the house has also received the US Green Building Council's highest LEED rating of Platinum, the first one in Vermont and the first to receive the NESEA Net Zero Energy prize in 2009. Heating a home in this cold cloudy northern climate was the biggest design challenge. Even though a lot of what we have done required "out of the box" thinking, the conceptual solution was in fact, "a box"–in effect a six-sided Styrofoam cooler. The box was then altered for scale and aesthetics, proper fenestration and day lighting etc, but still maintained its simple massing. To achieve maximum energy efficiency an Energy 10™ model was created to look at: passive solar and thermal mass, massing, envelope design, glazing, air tightness, mechanical systems, lighting and appliances. From the Energy 10™ model a spreadsheet with multiple options was developed to inform the choices for the design of the building and systems. While this process can only be described in a linear manner on paper, to synergize all of the factors described above, plans and elevations were worked simultaneously. To achieve Net Zero energy use requires a very tight energy budget which was made possible by using the natural resources of the site–the sun the earth and the wind. Using the passive energy of the sun was the first approach as the suns energy is free when you orient your house properly. The final footprint of the house is long and narrow, about 20' x 60', oriented east west for maximum solar gain. The first and second floor footprints are stacked for efficiency and the interior plans are open for flexibility. The open plan maximizes thermal mass and day lighting. The house is conventionally wood framed although In order to maximize insulation values and minimize resource use, 2x6 studs were placed 2' on center and walls were laid out in 2' increments. Closed cell polyurethane foam (R6.5 per inch) completely fills the cavity of the frame and one inch of polyisocyanurate (rigid foam board) was wrapped around the outside to cut off any potential thermal bridges. The entire wall assembly has an R-Value of 40, although more expensive the cost was minimal to the benefit. A 4" thick ground and polished concrete slab on the first level acts as the finished floor and as the thermal mass absorbing the southern sunlight through the triple pane, low–e, argon–filled fiberglass windows which were chosen with respect to orientation. On the south side windows have a Solar Heat Gain Coefficient (SHGC) of 0.61, a Visual Transmittance (VT) of 0.63 and a U-Value of 0.17. The remaining windows have a SHGC of 0.37, a VT of 0.57 and a U-Value of 0.15. We tapped the earth's energy with an 3 ton Econair GSHP which draws heat from the constant temperature of the earth to produce the hot water supply for the low temperature radiant heating system and domestic hot water tank. A GFX drain heat recovery unit is also in place to maximize energy efficiency by recapturing wastewater heat before it exits the building. It was not until we brought our loads down as far as possible that we introduced renewable energy generation. This was the best way to maximize its ability to produce more than we needed economically and without trying to overcome a huge load with sheer brut force. Meticulous attention was given to air sealing the home's interior. Corner, door and window breaks are filled with foam, taped and then covered with Tyvek house wrap. Similar attention to these details was carried out in the 2x10 roof assembly (R56). With this super efficient shell a Heat Recovery Ventilator was in order to ensure proper ventilation during the winter months. Otherwise the narrow footprint allows cross ventilation to cool the home when necessary. Being in a rural Vermont landscape we designed the house by taking cues from the local agricultural context. The exterior form expresses the simplicity found in barns and farm houses, which also allowed us to create a simple building envelope which was more efficient to build and to heat. By using a combination of 2-1/2" exposure clapboard on the main body of the house and corrugated metal on the intersecting form, it fuses conventional Vermont vernacular forms and materials with modern style. The interior was designed for a clean minimal aesthetic allowing focus to the carefully framed views out into the landscape. To create a house that maintained all the amenities of a conventional home with as little environmental impact as possible, to eliminate all fossil fuel burning on site, to maintain a high level of design and detail and to use the most conventional means and methods possible so that it would be affordable and replicable. The challenge was to do all of this in a cold northern climate. This home warrants Alex Wilson's 'passive survivability' status through it use of site, energy efficient design, and power production. The 44 acre rural Vermont landscape was chosen its ability to produce energy from the sun, earth, and wind, and food from the pastures and gardens. Energy security was also achieved through an efficient and tight enclosure design and the 10 KW wind turbine. To insure healthy indoor air quality for the inhabitants a Heat Recovery Ventilator was installed to ensure proper ventilation during the winter months. Otherwise the narrow footprint allows cross ventilation to cool the home when necessary. Natural and non-toxic materials and finishes were also specified for indoor air quality. Sustainable measures for this project were taken from environmental, social, and economic standpoints. Environmentally the home's design and construction treads lightly on the land and eliminates all fossil fuel burning on site. Materials and finishes were chosen for their life-cycle analysis of environmental impacts, durability and recyclability. We cultivate the land, growing our own vegetables and collecting eggs for our chickens minimizing demands for globally transported produce. Socially, our trails link the community to nature and produce produced from the land is being bartered with community members. The design of the home is vernacular in nature, relating to the history of the place and yet the home maintains all the amenities of a conventional home. Economically the cost of the home's amenities will ensure the home's resale value and the energy independence ensures its affordability as energy prices increase. By maintaining all of the amenities of a conventional homes, including indoor plumbing with hot showers, a kitchen with all the modern day appliances, and other features such as a programmable thermostat, this home functions as if it were a conventional home that consumes 4 times as much energy. The open layout and flexible design of the home will allows occupants to alter the use of space over time. For example the office on the second floor can be converted into a bedroom at anytime. Making a home energy efficient is not a design constraint. Being in a rural Vermont landscape we designed the house by taking cues from the local agricultural context. The exterior form expresses the simplicity found in barns and farm houses, which also allowed us to create a simple building envelope which was more efficient to build and to heat. By using a combination of 2-1/2" exposure clapboard on the main body of the house and corrugated metal on the intersecting form, it fuses conventional Vermont vernacular forms and materials with modern style. The interior was designed for a clean minimal aesthetic allowing focus to the carefully framed views out into the landscape. Photo from kitchen to living room. The most conventional means and methods possible were utilized throughout the design and construction of this home so that it would be affordable and replicable. The final cost for this particular home includes high quality, locally fabricated, and unique materials and finishes. The final solution was extremely cost–effective for the clients. However, more conventional choices for the materials would bring down the overall costs. The chosen building site had already been built upon with an existing 180' x 80' riding arena, with a residence within. Upon purchasing the property, neighbors came forward who were interested in starting their own horse boarding business, and they moved the prefab metal structure piece by piece around the corner, to its new location, saving everything down to the roofing screws. The new structure was located 100% on the existing footprint. To create a sustainable homestead the productive quality of the land and home was of the highest priority. The surrounding landscape is being utilized for its pastures and agricultural potential, including a garden, a chicken coop and orchard. The home also includes 100% natural daylighting and the highest regard for indoor air quality. 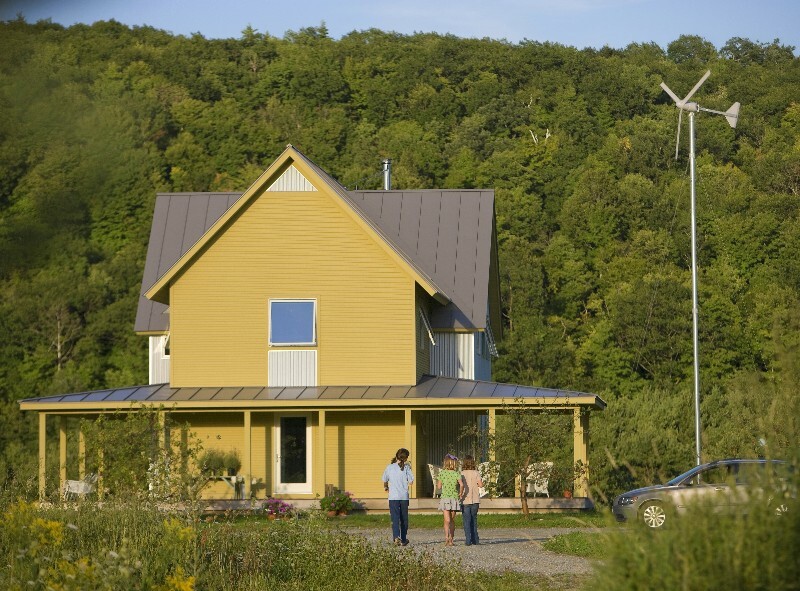 This home has reached Net-Zero distinction through the design and construction of an ultra-efficient shell with a low energy budget which is then supplemented by a 10 KW wind turbine. Comparing our use to the average energy use of a home in the Northeast is enlightening. Our home used 5,999 kWh compared to 33,757 kWh for the average home in the Northeast. To create the most efficient solution possible a diverse collaborative team was in order beginning in the conceptual design phase. A holistic approach for communicating was established for fine tuning the project, taking into account: construction methods, design aesthetics, affordability, minimization of construction waste, energy efficiency, site resources, and mechanical design strategies. There were definitely trade-offs and compromises but this was a balanced process where the elements which were taken from one area ended up benefiting another. The integrated holistic approach was the key to the projects' success. Heating a home in this cold cloudy northern climate was the biggest design challenge. Even though a lot of what we have done required "out of the box" thinking, the conceptual solution was in fact, "a box"—in effect a six-sided Styrofoam cooler. While this process can only be described in a linear manner on paper, the plans and elevations were worked simultaneously and a multitude of factors infiltrated the design process every step of the way. The first and second floor footprints are stacked for efficiency and the interior plans are open for flexibility. The open plan maximizes thermal mass and daylighting. One of the tradeoffs in our integrated approach was in the discussion about the sheathing. I knew that with lateral bracing we could save the material and omit plywood sheathing. The contractor felt very strongly that even though it may be a savings in material, the labor to detail the bracing properly would increase significantly, and secondly he felt the end product would not stand up as well, and eventually lead to slight movement in the interior. He did concede to using 2 stud corners for insulation and as counterintuitive as it looked, with the engineer's stamp, he agreed to eliminate unnecessary headers in place of more insulation. I believe the success of this project relied on the many synergies which occurred through planning as well as their serendipitous occurrence. One of the most important synergies was pairing the resources of the site with our needs, i.e. the sun, the wind, and the earth. Another was the choice to use electricity as the sole unit of energy, paired with the GSHP and wind turbine. It was serendipitous to find this particular site which met all of our criteria while at the same time having a neighbor who had a need and was able to take a 14,000SF structure with very minimal waste and energy use. An important lesson learned was to find the path of least resistance by using common sense and reducing the complications of multiple systems. Additionally, I learned how to take what may seem like a compromise and evolve successful relationships between the dynamic forces acting on a project. The project began with the selection of a diverse collaborative team. As the client and architect I hired Jim Huntington, the builder, for his experience in design and energy efficient construction; energy consultant Andy Shapiro of Energy Balance, to do the modeling and design of the systems using Energy 10™ software; structural engineer John Higgins of Artisan Engineering to evaluate and minimize lumber sizes and headers, dowser Patrick McManaway to determine the water resource on the site; and wind turbine installer Tom Halnon of Vermont Green Energy Systems to assess the feasibility and installation of a wind turbine. To achieve maximum energy efficiency an Energy 10™ model was created to look at: passive solar and thermal mass, massing, envelope design, glazing, air tightness, mechanical systems, lighting and appliances. From the Energy 10™ model a spreadsheet with multiple options were developed to inform the choices for the design of the building and systems. While this process can only be described in a linear manner on paper, the plans and elevations were worked simultaneously and a multitude of factors infiltrated the design process every step of the way. Advanced framing methods were utilized that decreased the amount of lumber needed for the construction of this home. All excess construction materials were separated for recycling onsite. The construction created less waste going to the landfill. We installed very simple monitoring devices including a separate kWh and Btu meter on the heating system, a kWh meter on the wind turbine, a wind logger to document the wind speed and other characteristics, and a meter which measures hot water use. All combined we were able to keep track of every unit of our energy consumption. These monitoring tools installed in our home made our family of four conscious of the direct correlation between our activities in the house, the exterior environment, and our energy use. From the experience of living in this house with our children I have learned that we absolutely can re–pattern ourselves to live within a framework of extreme energy efficient consciousness without feeling compromise. This home is a model for a new paradigm, for a new 'normal' way of living. The systems chosen for this project centered on achieving an ultra low all electric energy budget for the home. To start a passive solar design strategy was implemented, a long East-West axis with large southern exposed window ensured maximum heat gain from the sun. Then a Ground Source Heat Pump taps the earths stabilized temperatures for the heating of the home before turning to active heating systems. Additionally heat recovery measures such as the GFX system were chosen to help bring down heating loads even more, this GFX recaptures heat from hot water as it cycles through the house. Finally, the Bergey 10 KW Wind Turbine was chosen as the appropriate product to achieve the necessary amount of energy the house required after the utilization of these integrated systems. Energy Star Energy efficient lighting and appliances, as well as natural and locally crafted materials and finishes are used throughout the home. First we wanted to create a house with as little carbon footprint as possible. We did not want to burn any fossil fuels on site. All of our energy would be delivered with electricity produced by a renewable resource and the transportation of fuel to the site would be eliminated. A passive solar design captures the sun's energy first, secondly the earth's stabilized temperatures are tapped for the heating of the home and hot water. And finally, a 10 KW wind Turbine produces the additional energy required. Energy usage is monitored by the family and behavior is noted as a major component to achieving a net-energy producing lifestyle. The open layout plan allows day light to reach 100% of the living spaces. This with a passive solar southerly orientation and a plethora of natural materials make for a very comfortable living environment. All of the amenities of a modern day home are included in the home with special consideration for their energy efficiency and environmental attributes. Additional materials and finishes used throughout the home were chosen for their environmentally friendliness and their effect on indoor air quality. A Heat Recovery Ventilator is used for providing fresh air during the winter months and a narrow plan with carefully placed operable windows allow cross ventilation to cool and refresh the home throughout the summer months. An important lesson learned was to find the path of least resistance by using common sense and reducing the complications of multiple systems. Additionally, I learned how to take what may seem like a compromise and evolve successful relationships between the dynamic forces acting on a project.